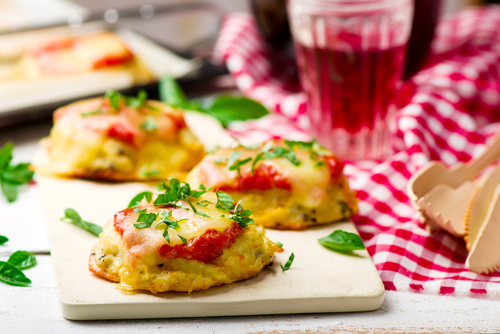 Start by pre-heating your oven to 450 degrees, and spray a muffin tin so that the bites do not stick to the sides once cooked. Take your 1 head of cauliflower, and wash, dry and grate using a food processor or cheese grater until it is a rice texture. In a hot pan stir fry the “cauliflower rice” until the cauliflower is clear (about 6-8 minutes). Place in a bowl and set aside to let cool. Place all of the other ingredients from the list in a food processor, and blend until smooth. Add to the bowl of cauliflower rice. Spoon mixture of rice into your muffin tins. Press "dough" down evenly and firmly to ensure it all sticks and stays together once cooked. Bake for 25-30 minutes at 450. Once they are done cooking, let them cool off in the pan for at least ten minutes. If you take them out too early, they might fall apart. Feel free to add some homemade red sauce to the bites for a little extra kick. Dice tomatoes are approved. I made these but they tasted like stuffing, not pizza.